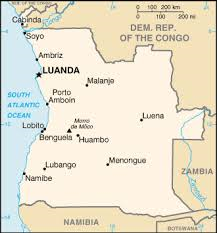 I often wondered where the name of Luanda, the capital and largest city of Angola, came from. After the African Cup of Nations was organized in Angola in 2010, I had started thinking about it: was it a Kimbundu word, or Umbundu, or Kikongo? or did it have Portuguese roots? 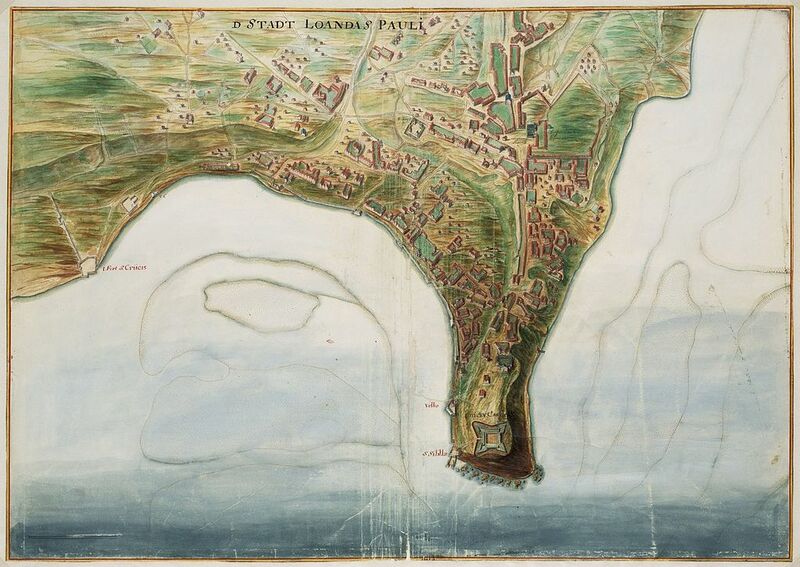 Well, it turns out that, on 25 January 1576, Portuguese explorer Paulo Dias de Novais founded Luanda under the name of “São Paulo da Assumpção de Loanda”. When he arrived on the Ilha do Cabo (Cape Island), he found an indigenous population, the Axi-Iwanda people, a subgroup of the Ambundu people which were tributary to the Kongo Empire. The island was an important location to collect zimbo, shells used as currency by the Kongo king before the arrival of Portuguese in the area. Novais established a Portuguese settlement of about 700 people: 350 soldiers, missionaries, merchants, and officials, and families, to first gain control of the currency, before establishing himself on the mainland, opposite the island. They started to use the name of the Axi-Iwanda inhabitants as a name for the island and the town, spelling it first “Loanda“, then “Luanda“. In 1618, the Portuguese built the fortress of Fortaleza São Pedro da Barra, and they subsequently built two more in 1634 and 1765: Fortaleza de São Miguel and Forte de São Francisco do Penedo , respectively. Of these, the Fortaleza de São Miguel is the best preserved. 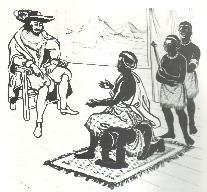 In 1622, Queen Nzingha had an audience with the Portuguese governor in Luanda (this was before she became queen). The city of Luanda has been the administrative center of the colony of Angola since 1627, except from 1641 to 1648 when it was under the control of the Dutch Company of West Indies. From 1550 to 1836, Luanda was an important center for slave trade to Brazil. When Angola became an actual Portuguese colony, the city was divided between white neighborhoods and indigenous ones, as was tradition in almost all European colonies. The white colonialists lived in huge villas with servants, while the local populations lived in huts. The majority of the local population present in Luanda were Ambundu and Bakongo. The colonial army would constantly guard the entrance to the European neighborhoods. 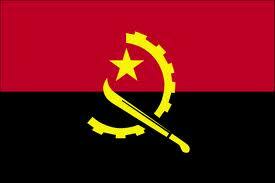 After the slave trade was abolished in 1836, Angola’s ports were then opened to foreign shipping in 1844. By 1850, Luanda was one of the greatest and most developed Portuguese cities in the vast Portuguese Empire outside Continental Portugal, full of trading companies, exporting palm and peanut oil, wax, copal, timber, ivory, cotton, coffee, and cocoa, among many other products. Maize, tobacco, dried meat, and cassava flour were also produced locally. In 1889, Governor Brito Capelo inaugurated an aqueduct which supplied the city with water, laying the foundation for major growth. After the establishment of the republican regime in Portugal in 1910, colonialism entered a new phase. The new Portuguese government started building schools in Angola. The first high school, Liceu Central de Luanda, was created in 1919. During the authoritarian Estado Novo years, Luanda was also used as a penitentiary colony, used to host convicted criminals. 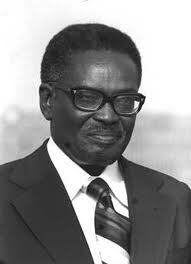 A few months after independence from Portugal in 1975, with Agostinho Neto becoming Angola’s first president, civil war broke in the country when the city of Luanda was attacked by the FNLA forces supported by Portuguese mercenaries. This assault was pushed back by the governmental army (MPLA) supported by Cubans in the battle of Kifangondo. Throughout the years, the civil war forced many people across the country to seek refuge in Luanda. After the death of Jonas Savimbi, UNITA‘s leader in 2002, a ceasefire was reached, and Angola finally arose from over 25 years of civil war. Today, Luanda is the siege of the country’s principal companies: Angola Telecom, Unitel, Endiama, Sonangol, Linhas Aéreas de Angola, and Odebrecht Angola (Brazilian company). Back in 1972, it was already called the “Paris of Africa.” Manufacturing is big in the city. Petroleum found in nearby off-shore deposits is refined in the city. Luanda has an excellent natural harbor. The city also has a thriving building industry, an effect of the nationwide economic boom experienced since 2002, when political stability returned with the end of the civil war. Large investments, along with strong economic growth, have made Luanda one of the fastest growing cities of Africa, and of the world. Surrounded by beautiful beaches, and rich through its culture, Luanda is truly an African pearl. Please enjoy this video of one of the jewels of Africa, Luanda.